Posted 5/30/2017 3:39pm by Kinley Coulter. Did you ever read the ‘Little House’ series of books by Laura Ingalls Wilder? ‘Farmer Boy’, documenting the early life of Almanzo Wilder, Laura’s future husband, describes a traumatic event in his childhood where he threw a stove blacking brush at his sister in his mother’s prized parlor… the pride and joy of his Mother's home… leaving a disgraceful, indelible and awful stain on the wall of that sacred room. I was reminded of that episode the first time the boys let the cows into our spotless, gleaming, new milking parlor in March. The first cow to lift her tail and ‘leave a deposit’ on the perfect, new concrete got a withering look from Jason and Jacob after they had toiled for five months on their prized parlor. Construction on the farm always and only happens in the winter because, well, that’s the only time we can do it. So they excavated in freezing rain, ran heaters to keep the footer and concrete block from freezing, hung roof trusses and screwed on steel in the snow. They plowed snow off the ground to grade it for a sloped concrete floor until, FINALLY, they were out of the weather in the nascent parlor and could work indoors on plumbing and structural steel and electrical fixtures. Anyway, the parlor is well ‘broken in’ by now, and is doing the job it was built for, admirably. We can line up 12 cows at a time and get the milking done in an amazingly short time. The cows enjoy a taste treat, while being milked, of half a pound of organic cane sugar each day. They attack their treat with the vigor of a dozen preschoolers, eagerly racing to see who can lick a lollipop down to the stick the fastest. Cows are very contented on lush pasture, but they are downright giddy when they get a few licks of sugar during the morning milking. It makes the job of getting the herd through the parlor a breeze. The efficiency and cleanliness of the new parlor is a sight to see. Gleaming stainless steel dominates the landscape. We had to suffer through 4 years in our pathetic antique parlor to appreciate this new one. Milk is cooled from ‘cow temperature,’ about 100 degrees, to 35 degrees in seconds. The fragile molecules that give real milk its remarkable flavor are very vulnerable to breaking down under the stress of being pumped. Our milking parlor and processing room were designed to minimize pumping. We make extensive use of gravity to drain milk, and vacuum to lift it gently. The milk we bottle and the milk we use to make our yogurt, ice cream, cheeses, kefir, etc. are all only ever pumped one time between the cow and your refrigerator. This makes the most noticeable difference in cheese, where the remarkable and complex flavor enhancing molecules are concentrated and magnified during the cheesemaking process. The best milk is minimally pumped and the best cheese is only stirred very gently. It’s always wise to handle precious things carefully. We built this parlor to last. It wasn’t cheap but if it lasts the 25 years we designed it for, it will only have cost us $10 per day, or 10 cents per gallon of milk on a 100 gallon day. I’ll leave you to do the math on what it costs to build an efficient, modern, milking parlor with farm labor in this day and age… it’s too depressing to talk about big expenses like that… I like little numbers like 10 cents :). So, the next time you pour yourself a tall glass of rich, fresh, sun-golden organic milk from Coulter Farms, you can visualize where it came from a little better… and you’ll know what 10 cents of your purchase went to pay for! Posted 5/17/2017 8:00am by Kinley Coulter. Here at the farm, spring is the time for lambs and calves and baby piggies. It seems that we need to add puppies to that list. We have not had a dog at the farm for the last several years and my middle son, Jason, reminded me that when it was ME spending long days on the tractor, I would, invariably, take my trusty dog ‘Fly’ with me. Jason has inherited most of the tractor work on the farm since Dad is at farm markets so often and he felt he needed a dog to keep him company. He remembers my stories about Fly shortening my long tractor days for me by patiently listening to my stories and commiserating about my problems as we mowed hay or spread manure. 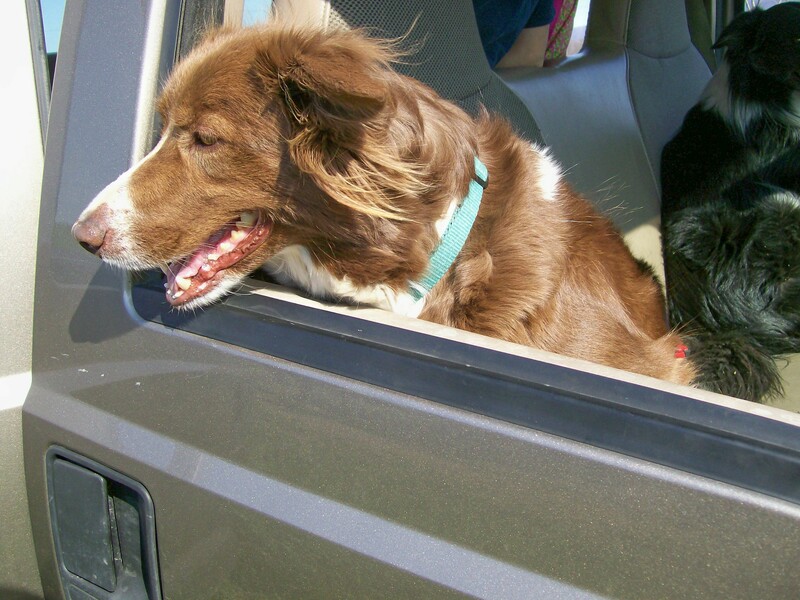 She would tremble with excitement when she saw a rabbit or a ground-hog or a snake from her lofty perch on the tractor. When I felt particularly magnanimous, I would stop the tractor, open the cab door and enjoy watching her try to catch that pesky bunny (she never caught one) or give the ground-hog or snake a run for his money (she did get a few of those!). 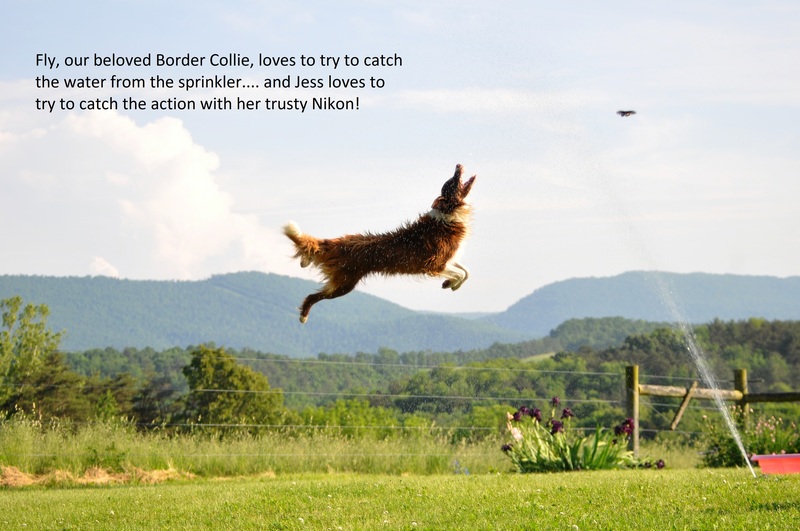 You can imagine the varmint’s surprise when the poor, safely cooped up Border Collie on the tractor came zooming after them… reveling in her new-found freedom. Some days were so hot that the purportedly air-conditioned cab was hotter than the outside air and my tongue would hang out further than Fly’s. I would offer her a drink out of my water bottle (I know… a little yucky… I wonder if she thought so, too?). She invariably accepted the drink but, never once the offer to ‘Go Home!’… to retreat from the scorching hay field to the precious, familiar, cool, shady spots at the house. I HAD to be out roasting in the field… she was there of her own free will. She was nothing if not a faithful tractor friend! That ‘fun’ ended up costing her her life. 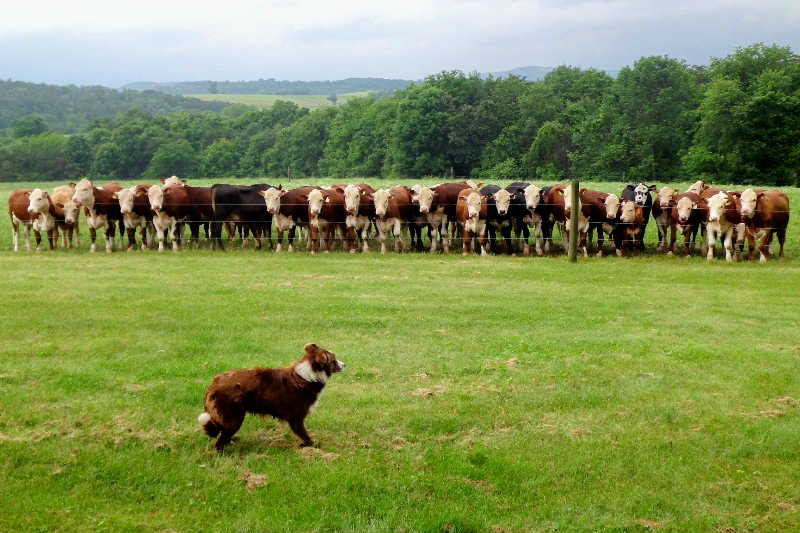 She would annoy cows when we were working in the pasture with our old farm pick-up truck. She would race away from their ire and hide, triumphantly, under the truck… safely out of the agitated cows’ reach… sometimes even nipping at their noses when them stuck them under the truck. Perhaps you can see where this sad story is going. Not once, but twice, Fly was playing her game right in front of a truck tire and got run over when it moved while she was preoccupied with her ‘cow games’. She recovered twice, but not thrice. Despite our best efforts to check under the truck and scold her out of the pastures… her misdeeds were her undoing. Poor Fly. At least is was a mercifully instant end. I was devastated to lose my friend and when I started to get over it… in a moment of weakness… we got a new ‘Fly’ puppy so Jason would have his own ‘tractor friend’ during long days of field work. We hope to exhort her to ‘play nice’ with the cows and sternly admonish her to stay out from under trucks. 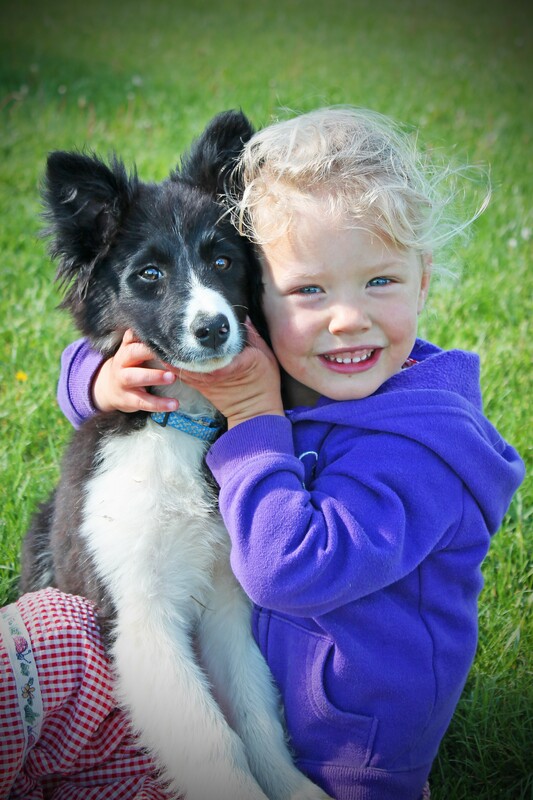 With all of the equipment operating on a farm, fear of being squished is an essential life-skill…. not just for dogs, but for people, too! 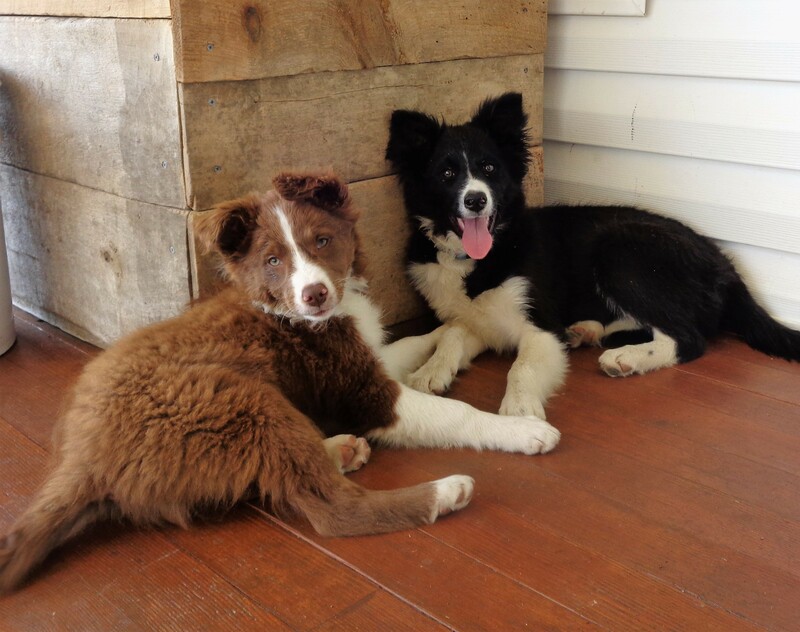 So, we find ourselves with not one, but two puppies at the farm. Fly and Gypsy are enjoying us and each other and making things a little brighter at Coulter Farms this spring. Posted 4/15/2017 12:54pm by Kinley Coulter. 'Tax Day’… April 15th… Certainly a day of Infamy for beleaguered taxpayers. April 15th has a different name at Coulter Farms…’Pasture Day’. This is the date that we schedule our hay supplies to run out, confident that we can turn the ruminants, here, out onto green pastures. We feed approximately six 1,500 lb. round bales of hay per day to sheep, beef cattle and Jersey dairy cows, from about Thanksgiving through ‘Pasture Day’. A little quick calculation is sobering… 150 days at six bales per day and $80/bale for Certified Organic hay adds up to $84,000 worth of hay to winter over our ruminants. And that figure doesn’t include bedding, mineral, feeding labor, equipment and buildings. Sigh… no wonder 100% Grassfed milk and meat and cheese is costly. 'Co-mingling' milk is something that we as a society have accepted as normal, but was unknown to our great-grandparents. Organic milk from stores comes from dozens or hundreds of farms and is ‘warehoused’ in massive raw milk silos where it is co-mingled. Most of us learned about ‘Bell’ curves in junior high school. So, what do Bell curves have to do with co-mingled milk? Well, if milk from 100 farms is mixed in a silo, the milk from 50 of the farms has come from ‘below average’ farms. What makes a farm ‘below average?’ Things like cleanliness and sanitation, animal welfare, animal health, integrity regarding organic farming requirements, and many other factors influence milk quality in ways that are not always tangible. Out of 100 farms… whatever represents the ‘worst’ farm is in that silo, too. As long as I’m on my soap-box… I’ll put in a plug for ’single source’ milk. The milk we use in our dairy products comes from a farm that we consider to be far out on the ‘good’ end of the Bell curve for quality…namely, Coulter Farms. A farmer who watches several tons of his milk drive away on a tractor trailer, headed for a distant ‘milk factory’ to be mixed with milk from hundreds of other farms can’t help but to have a different attitude towards his milk than we do. 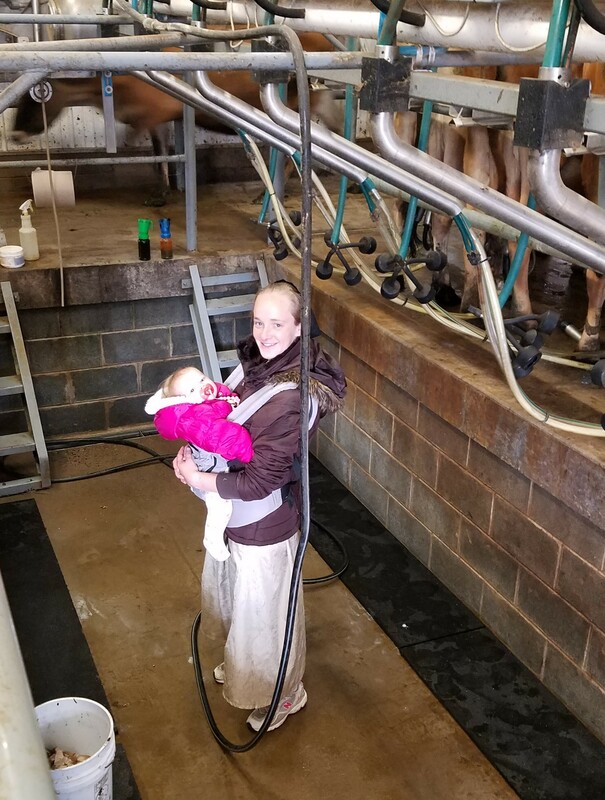 We know that every single gallon we milk out of our cows will be processed by us, and we have to hand that block of cheese, that quart of yogurt, that half gallon of milk, that tub of butter over to our friends at market. These are people that we know and appreciate, and people we have to face every week. These are people who literally put food on our dinner table as they purchase our dairy products. This gives us tremendous satisfaction, and is a powerful motivation to produce exceptionally clean, healthy, wholesome, nutrient dense milk. So, on that next dismal, rainy market day when you’re considering just picking up milk at Whole Foods… get your umbrella and galoshes out and trudge on down to the soggy folks at the Coulter Farms booth for ‘single source’ milk. The votes you cast with your food dollar make a difference. Posted 4/13/2017 6:15pm by Kinley Coulter. Our discussion at breakfast this morning reminded me that every April is the same. The conversation was not about ‘How to get it all done’… rather, it was a more realistic topic… ‘What shall we abandon all hope of getting done?’ The rapid transition from bucolic winter to supernova-spring at the farm could be likened to revving a Ferrari to red-line and popping the clutch… you had better hang on tight! Highly productive and biologically dynamic pastures and hay fields are growing explosively…I’m pretty sure that on a still evening we can hear the grass growing! Lambs are popping up (out?) daily; Jersey dairy cows are freshening and their calves are nosing around wonderingly; the beef cows are starting to calf; even farm markets are reproducing… they have proliferated from one per week to four per week in the last 7 days. Whew! But, all is not doom and despair. We ARE blessed and need to remember to count our blessings. The mild winter reduced animal hay consumption and we have precious leftover organic hay this spring. The dry winter allowed us to treat the animals to a lot of ‘out on pasture’ days, which saves a fortune in organic bedding. Our winter product drops and winter farm market were very well supported, which has rescued us from the standard ‘flat broke’ cash flow crisis that March usually brings. We did bump the bottom of our bank account with a loud ‘Thump’ in March, but only after we had updated our market truck and our skid loader… so that was to be expected. We are now milking in our ‘just in time’ finished milking parlor, and it has eliminated many of the woes of the old parlor. We were able to invest some time and attention in our family over the winter, which does wonders for relationships that get a little stretched and neglected during the ‘green season’. Opening a barn gate and letting a herd of animals out onto lush pasture gives a farmer a deep sense of fulfillment after they have been unnaturally confined for much of the winter. I don’t speak ‘cow’ or ‘sheep’… but I can clearly read the joy on their faces as they stuff their muzzle into a patch of brilliant green grass, soft fluffy clover and magnificent dandelions... that gives even a harried farmer a warm, fuzzy, satisfied feeling inside. Health, strength and meaningful work to do are often overlooked blessings, as well. You can pick up some of our 100% Grassfed, Certifed Organic beef, as well as all our other products, at the following farm markets: Tuesdays - Crystal City Freshfarm Market, 3:00-7:00; Thursdays - Ballston Freshfarm Market, 3:00-7:00; Saturdays - Silver Spring Freshfarm Market, 9:00-1:00 and Old Town Alexandria Market, 7:00-12:00. Enjoy the beautiful spring weather, and have a cookout this weekend! Posted 3/29/2017 10:01am by Kinley Coulter. Ahhhh… April at last! Spring has sprung at Coulter Farms and our new laying hens are swinging into major egg production mode. The hens' innate drive to lay prolifically in the spring fits the start of our three spring farm markets very nicely. Most of our ‘laying ladies’ are brand new to egg laying and are probably grateful to have been designed to lay ‘miniature’ pullet eggs for the first month or so. Full size eggs coming from under-sized young poults can be an anatomical challenge, to say the least. These special spring ‘maiden eggs’ are highly sought after for their ‘egg-ceptional’ flavor. Many restaurants make a big deal of any menu items they can provide that are made with spring pullet eggs… try googling them. They cannot be bought at grocery stores because they don’t fit the ‘cookie cutter’ industrial egg industry model. We can only supply them in April… so enjoy the seasonality of small scale egg production… vive le difference! We are selling 18 pullet eggs for the dozen price… while they last! Use three pullet eggs in place of two regular eggs, and expect an abundance of flavor :). Regular size dozens will be in very short supply for the next month. Watch for the transition in our eggs’ yolk color as they move from spacious, but dormant, winter pastures onto lush, green spring grass… and then enjoy the next transition as their diet starts to include various crawling and flying bugs and worms in the warmer weather. My favorite eggs are July/August when the grasshoppers show up! Besides, there are few things more entertaining than watching a pasture full of hens frantically pursuing equally frantic grasshoppers… who needs television? Maybe we need a web-cam??? We start out with mostly fresh, new hens every spring. One advantage of this for the egg consumer is that a laying hen’s first egg is her most nutrient dense and highly mineralized of her life… as hens keep laying, from one year into the next they are producing so many high quality pastured eggs that their skin and feathers visibly begin to fade and become pale… the eggs’ yolks start to get pale and pathetic, too. Anyway, it’s just another cycle you can watch as you purchase real food from a real farm. We all know that strawberries in February are an aberration… now you know that eggs that are always the same are unnatural, as well. Posted 3/8/2017 1:55pm by Kinley Coulter. March winds are roaring, a warm sun is shining and the pastures are almost visibly trembling with the prospect of spring! Spring at Coulter Farms is calving season. Our Hereford beef cows and our Jersey dairy cows are not saying much, but if they could speak, they would be grumbling about being SO ready to get out of the barns, drop their 75 pound calves and go kick up their heels in the pastures. Frankly, the whole farm seems to leaning so hard into spring that it could almost tip over and fall on its metaphorical nose. 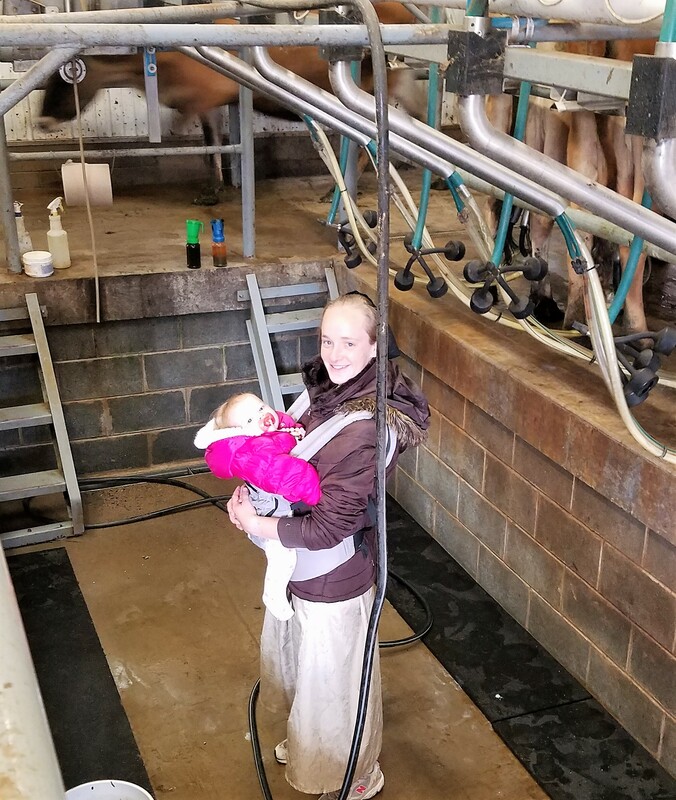 Hopefully, by next week we’ll have pictures for you of new Jersey calves watching their mothers being milked in our brand new milking parlor that my three boys spend the winter building… stay tuned! Posted 3/1/2017 1:52pm by Kinley Coulter. We try to time our lambing season to start March 1st. That way, the lambs are mostly weaned and ready to devour lush Organic grass pasture by late April. Our 100 ewes do not always choose to cooperate with our carefully laid breeding plans, though. Sheep have a five month gestation period... but putting our two rams in with the ewes on October 1st usually gives us a rush of lambs in early March followed by a steady flow over the next two months. We like the 'concept' of lambing outdoors on pasture... it seems like a good idea..... but it doesn't work in practice. Chilly spring rains and raw wind are a death sentence for a newborn, wet lamb. Lambs (especially triplets) only weigh a couple of pounds and are very vulnerable to wet and wind in their first few hours. A belly full of warm milk from momma and a dry fleece are all they need to survive and thrive. They do much better being born in dry 5 degree weather than on a wet 50 degree day. Another 'nail in the coffin' of outdoor lambing is predators. Red tailed hawks and bald eagles are infamous for pecking out the eyes of newborn lambs and then waiting, patiently, for them to die. While foxes and coyotes are something we have to watch out for, we have a lot more trouble with feathered predators than furry ones. Anyway, we have decided that the benefits of lambing on a nice fluffy, warm, dry, composting bedding pack in our spacious, airy lambing shed far outweigh the costs and extra work of lambing indoors. We had used a llama as a guard animal for many years. She did a good job of chasing predators (and, annoyingly, farmers) out of the pasture when there were baby lambs. However, she had a few exasperating quirks in her personality. She would lay her ears back, scream like a woman, and spit a nasty slime of rumen juice on anyone who dared to try to work with 'her' lambs. Another unhandy habit, which turned her maternal instinct into a curse rather than a blessing, was that she would woo newborn lambs away from their mothers by nuzzling, humming and calling to them. I wish I had a picture of the day we saw a lamb standing on his two hind legs, trying in vain to nurse from its 'llama mama' that not only had no milk, but was WAY too tall to be any help to the hapless lamb. We never could cajole that wayward lamb back to her mother, and ended up having to raise him on a bottle... :( ... Grrr. Anyway, when that llama went on to her reward, we chose to not replace her. Raising sheep is a great 'fit' for our farm. Sheep are most happy browsing on broadleaf and stemmy weeds that the dairy and beef cattle will not eat. These weeds are mineral rich and highly nutritive, but are often bitter and full of tannins that the cattle would benefit from, but are too spoiled to eat. Anyway, with no herbicides on our Certified Organic farm, we rely, heavily, on the sheep to come through and clean up what the cattle are too finicky to eat. You will never find a weedy pasture after our sheep have been through it. We like bringing our 100% Grassfed, Certified Organic Lamb meat to market, too, since it is such a rare thing. Sheep are very vulnerable to intestinal parasites, and receive a lot of toxic chemical wormers in a conventional system. Worming organically with things like diatomaceous earth, garlic and black walnut hull powder is a challenge, but we think it is worth it! Try 'googling' 'certified organic, 100% grassfed lamb' and you'll see that very few farms are raising lamb this way. I was turned off by lamb as a boy. We would have it at Easter and I would have to make a 'soup' of mint jelly to choke down the fatty, strong tasting stuff. Our 100% Grassfed lamb is a totally different meat than 'grain fed'. It is our family's favorite meat. Try some at this week's drop or farm market! Posted 2/2/2017 9:53am by Kinley Coulter. Winter has finally arrived in Juniata County... at least according to the calendar. It might surprise you to know that this unseasonably warm weather is not always a blessing for our farm and animals. Warmer days and mildly frozen nights... as well as rain instead of snow... produce 'cold and flu' season for the animals. They do much better in good cold, dry or snowy weather. Drizzle in the 30's is far harder on the animals than zero degrees and sunshine...even when they are in barns. We also face challenges with protecting our soil in warm winter weather. When the animals are outside on thawed ground, soil compaction and erosion rears its ugly head! So, whenever the ground is thawed and wet, we must put all 250 head of animals into the barns on Certified Organic bedding ($150/day plus labor for bedding... yikes! ), until the ground freezes again. The animals and the farmer are much happier (and wealthier!) when cold weather settles in and everyone can enjoy nice, frozen ground. Believe it or not, warmish weather is a worse problem for us than cold and snow.... who would have thought? A warm winter with minimal frost depth in the soil is a disappointment in another way, as well. Bitter cold weather serves as a 'miracle drug' to combat soil compaction by fluffing and heaving the soil as it freezes. Grass has a hard time thriving in the spring and summer in soil packed and firmed by animal and tractor traffic the previous growing season. A warm winter reduces our hay and pasture productivity... even the lowly earthworms, not to mention the grass and clover roots, appreciate the light, fluffy soil that a cold winter restores, . The final 'grumble' we would have about a warm winter is that our 2, 4 and 6 year old girls can't get out and 'run off their wiggles' by sled-riding and bombarding each other with snowballs. The ice rink has only yielded one good night of skating, so far... which leaves the 14, 17, 19 and 21 year old hockey players with excess 'wiggles', too. Rebecca finds a house full of 7 children with lots of unchanneled energy to be a 'sore trial' by February. Oh well, spring is just around the corner! So, we have quite a laundry list of challenges with 'unseasonably warm' winters. The sad part is that if February turns cold, you'll all have to put up with the laundry list of difficulties that COLD winters bring... :) All of that being said... nothing beats long, quiet winter evenings enjoying some family time while soaking up toasty warm wood-heat in the house... whether it's cold and dry OR warm and wet outdoors... we are Blessed! Posted 1/11/2017 2:59pm by Kinley Coulter. While there are thousands of types of cheese, the process for making them is very similar. Time, temperature, and culture...as well as the aging process, account for the differences in flavor and texture. The most important thing is to start with good milk.... here is Jared with 400 gallons of our 100% Grassfed, Certified Organic milk in our raw milk cheese vat. Of our approximately 20 types of cheese, this batch will be Hot Pepper Jack. Yummy, one of our favoritest! Raw milk is very slowly stirred, and gently heated by water piped in from our outdoor wood furnace. Flavor molecules in milk are very complex and fragile, and rough stirring or pumping makes for insipid cheese. When the sun-golden milk reaches about 80 degrees, the proper culture is added to the milk. The milk is golden due to extremely high levels of Beta Carotene (vitamin A) present in the milk, which comes from our beautiful Jersey cows eating nothing but green grass or fermented hay. After a period of ripening at about 92 degrees, the cheese-maker will then 'cook the curd'. At approximately body temperature (98-102 degrees), he will add rennet, and leave it sit until it coagulates, forming a firm "curd". When the curd is sufficiently firm, Jared uses a frame with thin wires, called a curd knife, to cut it into half inch pieces, and leaves it to separate into "curds and whey". After separating, the whey is drained into a holding tank through a hose attached to the bottom of the cheese vat. Sea Salt, and any herbs or spices, are added and stirred in (hot peppers, for our pepper jack, in the picture), and the curd is shoveled into 40 lb. press boxes, called 'Wilson Hoops'. The boxes are loaded into a press frame, with levers and weights, and the loose curd is pressed at specific pressure, time and temperature into 'green' (or 'unaged') cheese. The cheese is fairly flavorless and rubbery at this point. This fresh cheese is then either vacuum packed in bulk loaves, or left to age in a 'cave' environment with only a natural rind to seal the cheese. After aging in our aging 'cave,' the cheese is packaged, and ready for you! The pictures above show part of our 'cave aging' room where 12 pound wheels of Gruyere are settling in for a year or two of' 'hibernating' at 95% humidity and 50 degrees... not a bad life for a wheel of cheese! Jared keeps careful track of their ages and development. Here, he is washing the rinds of each individual wheel. The whey which was drained off is fed from a holding tank to the frantically feasting piggies... organic, grassfed, raw whey is much more highly anticipated than boring pig food! The most highly anticipated pig food, however, is when something goes awry (seldom) and the pigs get a batch of 'flop' cheese... producing an entire day of the happiest pigs on the planet! The picture above shows our skid-loader draining several hundred gallons of whey into the whey troughs. It matters what your food eats. Posted 1/4/2017 6:18pm by Kinley Coulter. Well winter is finally here...with a vengeance. Green pastures have faded into a dim memory, and all of our ruminants (beef and dairy animals and sheep) are settled into their winter diet of 'baleage'. 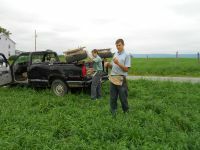 We spent much of our time and energy in the green season mowing, raking, baling and wrapping about 1,300 round bales. It occurred to us that many of you may not know much about this important component of what your food eats. We choose to 'ensile' most of our best hay. Ensiling is baling it at a high moisture content that would allow the hay to rot in the presence of air. To get around this, we push our bales through an ingenious wrapping contraption...it hermetically seals the bales so the sugars in the hay can ferment anaerobically (without air.) Have any of you ever made sauerkraut? Same principle. We end up with high moisture hay that is far superior to most dry hay. The most nutritive part of hay are the grass/clover leaves... the problem with baling dry hay is that the raking and baling process shatters the fragile dry leaves and much of the precious sugar, fats, and proteins in the hay ends up blowing out the back of the baler... leaving mostly non-nutritive stems... we call that pine-needle and sawdust hay. By baling the hay wet, we virtually eliminate leaf shatter loss. A tremendous challenge to 100% grassfed farming is getting sufficient energy (sugar) in the hay to balance its high protein levels. The baleage has a remarkable sweet smell that causes the animals to totally forget their manners and get pushy at the feeders. Also, the fermented hay is extremely high in probiotic activity which is an enormous immune system booster to the animals... obviously, healthy animals produce healthy food. We end up with a fair bit of plastic to deal with by the end of the season but it ends up being fully recycled, and wrapping our round bales allows us to store 5 barns worth of feed outdoors... no barns to build and no barn property taxes to pay on tubes of wrapped bales laying outside on the ground! We think fermented hay is a no-brainer, win/win situation for the farmer, the animals and for our valuable customers and their families. We hope you agree!